The historic PacMed building. Photo by Wendi Dunlap. There had been some talk that City University would move into the PacMed/Amazon building at the north end of Beacon Hill. However, the university has decided instead to move to the Sixth & Wall building in the Denny Regrade (or Belltown) area, according to the Seattle Times. 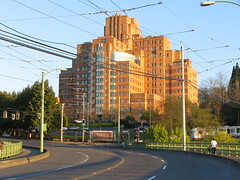 The building was once the home of the Seattle Post-Intelligencer, and later of Group Health. “The university also considered the PacMed building on Beacon Hill—Amazon.com’s former headquarters—but chose Sixth & Wall after taking students to visit both buildings, (City University spokesperson Tarsi) Hall said. We aren’t sure, but was Beacon Hill just dissed? Chef Vincent Rivera of Jazz Alley will be at El Centro de la Raza on Sunday, January 29 at 1 p.m. for a special cooking demonstration, making mole enchiladas and traditional side dishes. The demonstration will include both meat and vegetarian food. Tickets are $40 and will benefit the El Centro de la Raza Senior Nutrition and Wellness program, which provides meals along with daily social, exercise and educational activities to seniors. Tickets may be purchased online through Brown Paper Tickets. To sign up for a free treatment, visit the CommuniChi website. CommuniChi is located inside the El Centro de la Raza building, at 2524 16th Ave. S. #301. A video look at “another Tuesday night on Beacon Hill,” with Alleycat Acres. The Benders art show at NEPO House is extended through January 28 because of last week’s snow shenanigans. More info at the NEPO website. Save the date—on February 4 there will be a ROCKiT Art Chair community celebration party at the library, and at Jose Rizal Park, there will be a dedication of a monument to honor World War II Filipino defenders of Bataan and Corregidor. Stay tuned for more information about these events here on the blog soon! 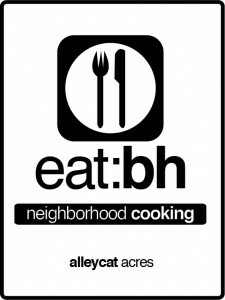 The folks at Alleycat Acres have a new neighborhood project this winter: a Beacon Hill community cookbook! They are compiling recipes from the neighborhood to put together into an e-book. To make this happen, they are asking for your recipe submissions. All submitters get a free PDF copy of the cookbook when it’s finished. The current plan is to have the book finished by spring. Alleycat Acres will also produce a cookbook for the Central District, so spread the word to your friends in the CD, as well as your neighbors on Beacon Hill. We look forward to reading—and trying!—the recipes Beacon Hill neighbors will share. 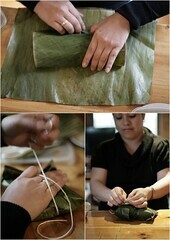 Making tamales. Photo by Noema of Intercultura y Cocina, via Creative Commons. El Centro de la Raza has a lot going on in upcoming weeks at their building at 2524 16th Avenue South, including cooking and language classes, free tax prep, and electronics recycling. Graciela Gonzalez, El Centro’s Human Services Director, is teaching a class on making tamales. The class fee is $50, and students will be able to take home a dozen tamales along with the recipe. Each class is limited to six students. The class dates are Saturday, March 20, from 10:00 am to 12:30 pm, or Saturday, April 17, also from 10:00 to 12:30. Sign up at Brown Paper Tickets. El Centro’s conversational Spanish classes will begin on Monday, April 5, and will continue on Mondays and Wednesdays from 6:00 pm to 7:30 pm until June 9. Students will be able to learn Spanish with other adults in a relaxed, yet professional setting. The class fee is $300. Here is the registration form. All proceeds from these classes go to support El Centro’s human service, child and youth, and education and skill-building programs. As we wrote in January, United Way of King County is providing free tax preparation services to low-income taxpayers at El Centro. Tax assistance is provided in English and Spanish by volunteers who are trained and certified by the IRS. The free tax prep services will be on Tuesdays and Thursdays from 5:00 – 9:00 pm and Saturdays from 10:00 am – 2:00 pm until April 15. Those eligible for the free service include anyone whose household made less than $50,000 in 2009, and who is filing a basic tax return only (no rental income, business taxes, or sale of property or stock). phones, video game consoles, printer cartridges, digital cameras, DVDs, and more. The Cartridges for Kids box is in room 304, on the top floor of the El Centro building at 2524 16th Avenue South. If you have a large amount of stuff to drop off, or if you are unable to come up to the top floor for medical reasons, please call Elliott Jones at 206-957-4652 to work out the logistics.